Undated photo of quarry. Probably taken later in its operating life. those in the phto to the left. 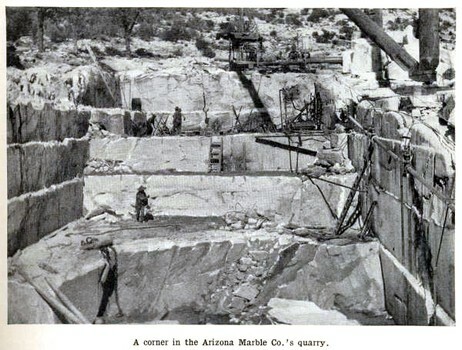 The old Arizona Marble Mining Company quarry is located in the northwestern corner of the Chiricahua Mountains in southeastern Arizona. The company started up in 1909 and was in full operation shortly thereafter. An article published in a 1913 issue of Mine and Quarry magazine provides some insight into the quarry operation during those early years. The Sullivan Machinery Company provided much of the equipment that was used to remove the marble. 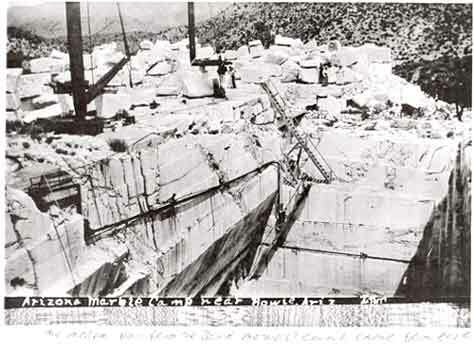 In the quarry, Sullivan duplex channelers were used to cut vertical grooves that outlined the blocks of marble. 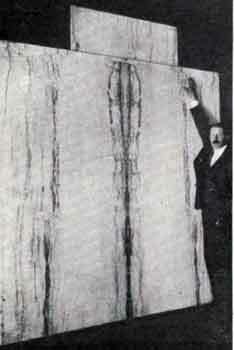 Sullivan hammer drills were then used to split the blocks from the country rock. The hammer drills were powered by, what else, a Sullivan air compressor. Once loose, the blocks were lifted out of the pit using one of two large derricks. One of the derricks was rated at 50 tons and the other at 30 tons. The derricks can be seen in the two vintage photos of the quarry. They were set up so that one engine could be used to run either of the two hoisting mechanisms. The derrick hoists, the channelers, air compressor and the equipment in the mill were run by steam that was generated by 115 H.P water tube boilers. These boilers were wood fired from materials gathered around the quarry. A gang saw, rubbing table and polishing table were used to slab the blocks of marble into panels. Heavy duty wagons and a 110 horsepower traction engine were used to transport the blocks and panels of marble 14 miles to the north to a railroad station near Bowie. The average load per trip was 60 tons! According to the Mine and Quarry article, the marble was considered to be very high quality and had been used in several bank buildings in Denver Colorado; Missoula Montana, and Champaign Illinois. Locally, the marble was installed in a church in Bowie. I had hiked into the old quarry in the early 1980's with several of my high school students. The route was along the old haulage road. At the quarry site, there were many blocks of marble that had been removed from the quarry and had been stacked for future processing. A few sawn panels were still in their racks. At that time, the wooden framework for the mill was still standing. The two power plant boilers were in place. There was very little if any other mill machinery still around. I returned to the area in the late spring of 2011. The old haulage road has recently been upgraded. Steel bridges are in the process of being installed. It is obvious that someone has plans for the area. The old quarry is still much like it was on my previous visit. The wooden mill building has collapsed and the panels of marble are gone. But other than that, things seemed pretty much the same. After I returned home, I happened to thumb through an old boiler manual and came across the illustration below. 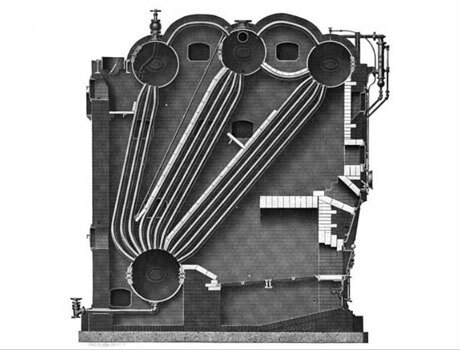 The illustration seems to be very similar to the style of boiler seen at the quarry. It is an example of a Stirling Boiler that used a stack of steam and water drums. Water circulated through nearly vertical tubes between the drums. Steam was pulled off from the top set. This style of boiler first appeared around 1890, and by 1900 were very popular. They were efficient but large in size. The boiler tubes however could not withstand very high pressure so the boilers were used in low pressure applications. This type of boiler was constructed with as few as 2 drums or as many as 5 drums.